The aim of our kill-switch safety project is to design and measure a system that enables maintaining stable amounts of E.coli during eucaryotic cells transfection. Its functionality is based on MinC protein – a protein that inhibits bacterial cell division. MinC prevents FtsZ ring formation in the polar region of the cell (see background). MinC protein slowers division of E.coli cells but it doesn’t destroy them. In this case, it enables safe delivery of our desired proteins to the inside of eucaryotic cells – in case of leaky expression it doesn’t cause premature bacterial lysis and release of our proteins. The system is universal – it can be used in all bacterial species forming FtsZ ring during cell division (see background). We performed both dynamic and static measurements (see design and results). Dynamic measurement describes optical density (OD) of E.coli and the number of colony forming units (cfu/ml) on agar plates due to IPTG induction time. Static measurement describes OD and cfu/ml under different IPTG concentrations. We used two different negative controls: one carrying MinC part only on pSB plasmid, IPTG induced, the second carrying our construct without IPTG induction (our control for leaky expression). During the experiment we used two different RBSes (B0032 and B0034) for additional regulation of gene expression to study how much different RBSes would influence the general expression of this system (see design). 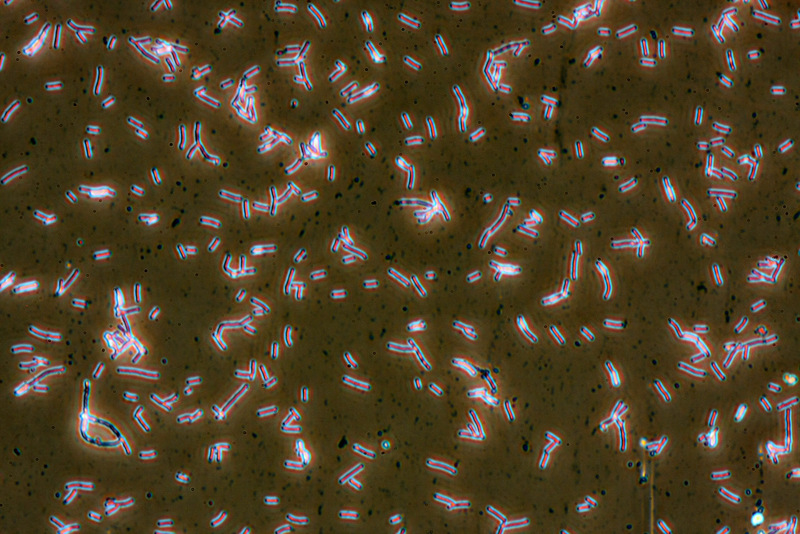 Finally, we observed filamental E.coli cells formation under the microscope. The observation is consistent with theoretical basis of MinC function. MinC stops cell division even tough bacterium can grow and enlarge its size.